It’s official. China and Taiwan have signed an agreement to promote a number of telecommunications technologies, including Google’s Android mobile software and networking technologies for wireless cities. The agreement came at a conference focused on choosing technologies and co-developing global standards to create business opportunities for China and Taiwan. Backing by the two countries means a huge potential market as well as manufacturing partners for developers of chosen technologies. The choice of Android, for example, means a potential market of over 800 million mobile phone users for compatible software and smartphones. While many of those mobile subscribers are likely use the Ophones supported by China Mobile, the Ophone OS was made from Android, so smartphones and software made for Android can be readily tweaked for Ophones. “Working together in this new era of information and communications technology will greatly benefit businesses in China and Taiwan,” said Shyu Jyuo-min, president of Taiwan’s Industrial Technology Research Institute (ITRI). “Investing together in new telecommunications technologies and services will boost the global competitiveness of both sides in 4G wireless broadband, cloud computing, wireless cities and more,” he added. The broad agreement put emphasis on technologies used by China Mobile, such as Ophone software and TD-LTE (Time-Division Long Term Evolution), technology in line to replace TD-SCDMA (TD-Synchronous Code Division Multiple Access), a 3G standard made in China to reduce the nation’s reliance on foreign technologies. China Mobile boasted over 544.2 million subscribers as of the end of April. 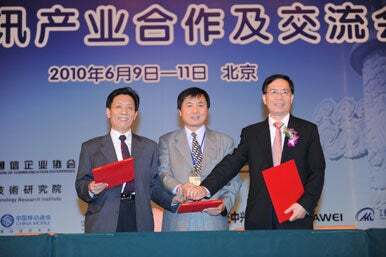 Officials from China and Taiwan officials reached a telecom agreement. The agreement also includes initiatives important to Taiwan, such as WiMax wireless broadband, which the two countries plan to use with TD-LTE to build wireless cities. China and Taiwan have worked more closely in recent years to match Taiwan’s technology prowess with China’s huge market. Their goal is to develop technical standards so they don’t have to rely on or pay license fees for technology developed elsewhere. They ultimately hope to create their own global standards. Last year, these efforts led to the building of the first TD-SCDMA test network ever in Taiwan. Hwang is one of the highest ranking Taiwanese government officials ever to visit China in an official capacity, but his title was changed for the event because China recognizes the island as a province of its own. He was referred to as the “leader of the Taiwan delegation” at meetings in Beijing. The relationship between China and Taiwan is tense, but the work on technology is meant to encourage peace across the Taiwan Strait, the 180-kilometer (112 mile) stretch of sea between island and mainland China. Taiwan and China separated amid civil war in 1949 and China has said it will attack Taiwan if it seeks formal independence. Officials at the telecommunications meeting in Beijing outlined a number of plans to promote Android in a range of devices, from smartphones and e-readers to netbooks and tablets. The software is already popular among gadget makers in Taiwan such as High Tech Computer (HTC), which built the first-ever Android-based smartphone, the G1. The two countries plan to develop an organization to promote Android and the Ophone, develop product specifications and reference designs and more, according to Ho Pao-chung, a director at Taiwan’s Institute for Information Industry. Work will also be done on standard user interfaces for devices, as well as new products and services for mobile cloud computing. A product testing and certification center will also be built to help companies bring gadgets, applications and services to market more quickly. Taiwanese cellular service providers Taiwan Mobile and Far EasTone Telecommunications said they do not have any immediate plans to adopt Ophone technology and will stick with Android. “We will mainly focus on Android phones for now, but will keep monitoring the Ophone and other new developments on a regular basis,” said Alison Kao, a Far EasTone representative. Her company is already working with China Mobile in a number of areas, including TD-SCDMA and TD-LTE. China Mobile has said it will buy a stake in Far EasTone as soon as permissible by Taiwan law.